“I will”, said the Turkey. 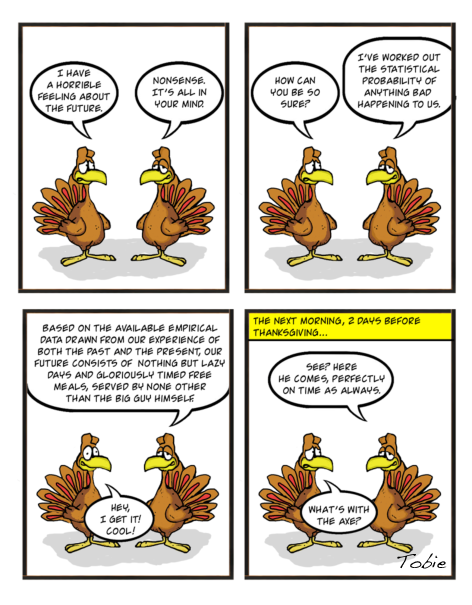 I am indebted to Nassim Nicholas Taleb for the turkey analogy. Taleb borrowed it from the philosopher Bertrand Russel and used it in his provocative book The Black Swan to illustrate the folly of predicting the future by using the past as a point of reference. Along with scholars such as Daniel Kahneman (Fast and Slow Thinking) and Daniel Gilbert (Stumbling on Happiness) Taleb points out that humans are outrageously irrational when they try their hand at forecasting the future. The topic intrigues me. As you may know, humans are most egotistical and idolatrous when they imagine what their own futures are going to look like. It is not our photo albums or mirrors that inspire self-worship, but our projections of an idealised future self. Our past and present selves are simply too real to be worthy of deification, and so we use the future to shape and mould the image of I. Reading Isaiah 14, it is clear why John tells us that “the devil has been sinning from the beginning” (1 John 3:8). The seed of the serpent was forged in eternity before time, when the contentment and perfection of “I am” was replaced with the desire of “I will”. And so “being” was replaced with “becoming”, beholding with visioneering, the Creator with the creature, rest with striving, contentment with anticipation, the now with the then, the “thank you” with “if only”, the treasure of having with the emptiness of wanting. The moment they believed the promise, and acted on their newfound faith, they too were brought down to Sheol. Note that the first sin was in fact the second sin, but that it was like the first sin. The enmity between the seed of the woman and the seed of the serpent began here. The “I will” became a collective in Genesis 11, when an entire nation aspired to penetrate the heavens and found a name and identity for themselves. “I will” became “we will”, and so the seed of the serpent that had become the seed of humanity became the seed of the kingdoms of this world. The enmity continues throughout Scripture and finds its ultimate manifestation in two births. The first came into the world and restored our understanding of the “I am” identity, the partaking in that which is and cannot become, for how can perfection be more than what it is? This was the one who defied the arrogance of the serpent and his offspring, by saying “not my will, but yours be done.” This was the one who defined divinity in his “I am” statements, quoted above. This was the one of whom was said that he, “though he was in the form of God, did not count equality with God a thing to be grasped.” In each and every way he contradicted the aspirations of the serpent and his offspring. The first birth manifested the seed from heaven, and revealed its nature as that which is and cannot become, which has and cannot want, which beholds and does not imagine. If the first birth was God’s Messiah and a revelation of his perfection, then the second birth is Satan’s messiah and a revelation of his imperfection and subsequent striving to “become”. As the seed of the woman brought Christ into the world, the seed of the serpent brought forth the exact opposite and antithesis of Christ, aptly referred to as “Antichrist”. Naturally, the Antichrist is the incarnation of the human will and its striving, and so, in accordance with the first and second sin, and all the sins since then, he is made manifest in one way only: “He will oppose and will exalt himself over everything that is called God or is worshiped, so that he sets himself up in God’s temple, proclaiming himself to be God” (2 Thessaloninas 2:4). Naturally, for his coming “will be in accordance with how Satan works” (verse 9). Correct me if I am wrong, but it would appear that even the great apostasy is no longer in the future, but in the present.